The airline has announced several new destinations for its summer schedule. AER LINGUS HAS CONTINUED the expansion of its long-haul network, announcing a new Dublin to Miami route as part of its new summer schedule. 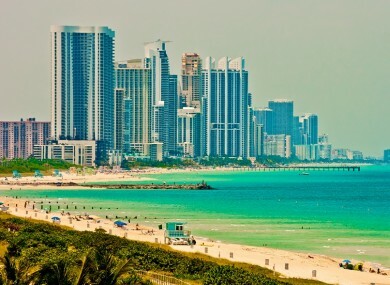 The Miami, Florida flights are in addition to Aer Lingus’s existing transatlantic routes from Dublin, which includes cities such as New York and Boston. The airline also has several flights running from Shannon including Boston and New York, and has just launched several new routes to Los Angeles, Newark and Hartford. The company has 13 transatlantic routes in total. In addition to its expanded transatlantic network, the airline is also including two new European destinations in its summer 2017 programme. Direct flights to Porto in Portugal and Split in Croatia have both been added, with the company also extending the winter route from Dublin to Fuerteventura in the Canary Islands into the summer. Aer Lingus announced that it will increase the frequency of its Los Angeles service to daily flights for summer 2017, while the Dublin to Orlando route will increase to four times per week and Chicago will also become a double-daily service. The airline said that its new summer schedule “underpins Aer Lingus’s strategy of expanding its Dublin airport base into a major European transatlantic gateway”. Aer Lingus chief executive Stephen Kavanagh said that the company is “delighted to announce the further expansion of our transatlantic network”. Dublin airport managing director Vincent Harrison said he was delighted with the new Aer Lingus routes, and added that they will “improve connectivity to North America”. Aer Lingus said that the new routes “comes off the back of International Airlines Group’s (IAG) commitment to expand the Aer Lingus transatlantic business”. British Airways parent company IAG acquired Aer Lingus last year in a deal worth about €1.4 billion. As part of his pitch to get the government to hand over its share in the former state carrier, IAG boss Willie Walsh promised four extra transatlantic routes by 2020. Email “You'll soon be able to fly direct from Dublin to Miami on an Aer Lingus plane”. Feedback on “You'll soon be able to fly direct from Dublin to Miami on an Aer Lingus plane”.